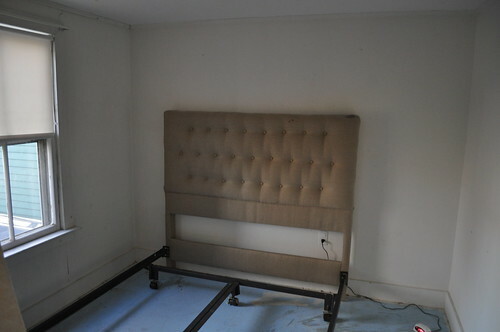 I brought back my new linen tufted headboard from Maine this weekend. My mom worked on the project with a local Portland upholster. Thanks mom for doing such a great job on the buttons! After barely fitting the headboard into our truck for the ride home we were having serious doubts that we would be able to fit the headboard into the house in one piece. Moving anything in is a headache; the doorways are extremely narrow and the stairs are a tight twist. We decided it would be easier to bring the headboard through the bedroom window. I wrapped the headboard in an old blanket and Greg tied some climbing ropes around the piece on the ground. 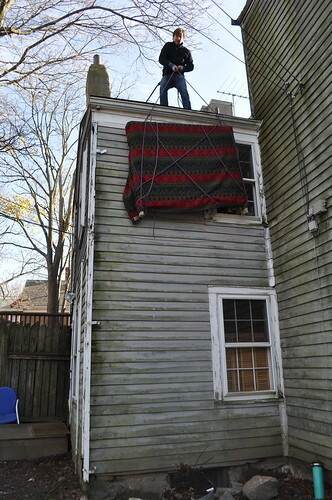 Greg slowly maneuvered the headboard up the side of the house to the roof. 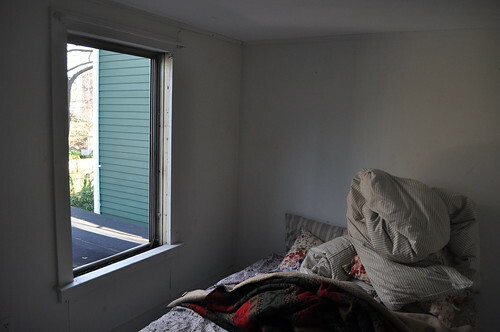 Once he removed the bedroom window the headboard slid right in. Yeah! Not so bad…and nobody even screamed. I love the headboard in the bedroom. Eventually, the space will get gutted and the ceiling opened up into the attic. I was just tired of having my mattress sitting on the floor like a college student. Hopefully, I’ll find some new bedding and nightstands in the next couple weeks. A coat a paint on the walls and floor will be inexpensive and help clean up the space. I can’t wait to have a room that doesn’t remind me that I’m living in the middle of a full house renovation. congrats, what a feat! the headboard looks great. I also adore your Toast pillowcases. love the stripe duvet.. where did you get it? Wow, fab. 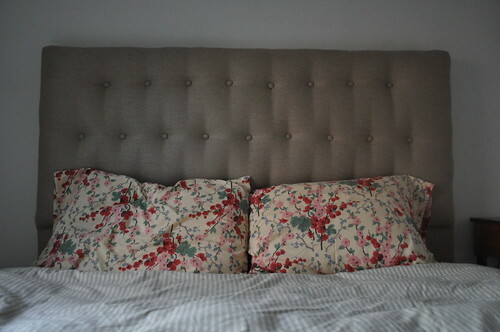 I love headboards like this. I can’t believe you got it in through the window. Looks hard. Also, this leads me to comment: You are so lucky you have all your old windows. The headboard looks so nice, and I, too, love those toast linens. The pillows are from Toast last season, sorry. The pillows actually belong in my guest bedroom. I stuck them on my bed till I find something else. It looks beautiful! And your pillowcases are gorgeous! Where did you get those pillowcases? They would match my bed perfectly! looks so great! can’t wait to see the rest of the room come together. Hi Katy. It is so exciting watching your progress. You are doing a great job! yeah!! I’m glad you like it…it looks great. So glad it made it in the house. Nice job, Greg. Your headboard is just lovely! I made my own, out of velvet, about a year ago, but it looks nowhere near as nice as yours! Looks GREAT Katy! So classic and warm. Everyone is just starting to decorate their homes for holidays. I’ll post some shots soon. It looks fab! p.s. I’m anxiously awaiting getting some Christmas decoration inspiration from you. My 1725/1890 home is needing some holiday loving. Perhaps some shots of Marblehead home exteriors similar to the great ones you posted around Halloween?